1. Department of the Navy. NAVFAC P-81 Personnel Shelters and Protective Construction (December 1972); 328 pages, 100 plus illus. 2. Department of the Navy. NAVDOCKS P-310 Planning Dual-Use Shelters (December 1963); 138 pages, 144 illus. 1. 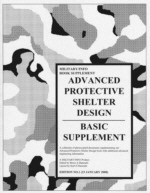 We also have an other book supplement along with this supplement: Profession Supplement, as well the basic book: Advance Protective Shelter Design.